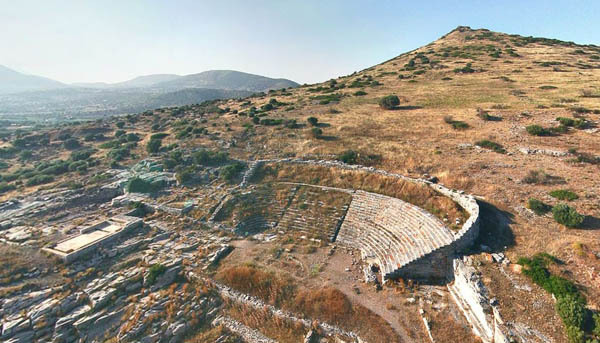 The ancient theater in Thoricus is built on the rocky slopes of the coastal Velatouri hill, in direct continuation of the excavated settlement of the ancient city of Thoricus. In immediate proximity to the west of the monument there is a house and a laboratory for metal cleaning (washer), and to the south of the orchestra there is a cemetery, which was in use from the 6th to the 4th century. BC. The theater is elongated with a linear central part and curved ends. 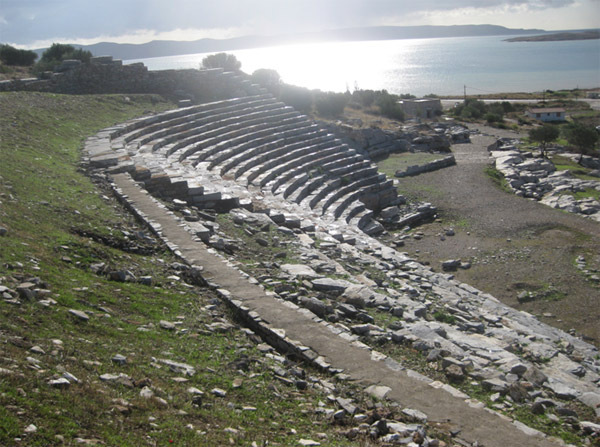 As realized after the discovery of other theaters Attica [Rhamnus, Ikarion (Dionysus) Evonymos (Trachones)], its rectilinear shape is no exception. 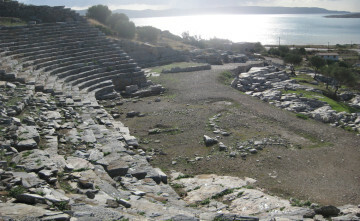 The theater’s orchestra is rectangular (approximately 16×30 m.) with curved angles towards the cavea. In its southern open side, it is supported by a 24 meters long retaining wall, which has its ends attached on the natural rock. This retaining wall replaced an older one, increasing thus the total area of the orchestra, which is 443 sq.m. The western side of the orchestra is occupied by a small temple of Dionysus, from which survive only the foundation, and an eastern rectangular structure, possibly an altar. The cavea is surrounded by a retaining wall of coarse stones, which is partly carved in the bedrock, particularly at the edges, while its center was given shape after a backfill. The cavea is divided by two stairways in three tiers of unequal size. The central tier, which is the largest, is almost straight-lined, while the eastern and western ones are curved. The seats of the viewers are arranged in 21 rows. The cavea is accessible from the eastern and western lanes. The western lane leads to the settlement. The upper cavea was added at an latter stage, following the building a new, striking retaining wall overlooking the retaining wall of the lower cavea. The intermediate space was banked in order to obtain the suitable inclination that would help viewers sit, either directly on the ground or on wooden seats in 10 to 12 rows. The upper cavea was accessible from two entrances on the north side, behind the retaining wall. The eastern entrance was a single paved corridor, while the western one was constructed as a bridge, supported by a pointed arch. The theater is built of a roughly chipped brown-greenish limestone found in the area. The retaining wall of the upper cavea is carefully built of limestone carved into rectangular blocks. 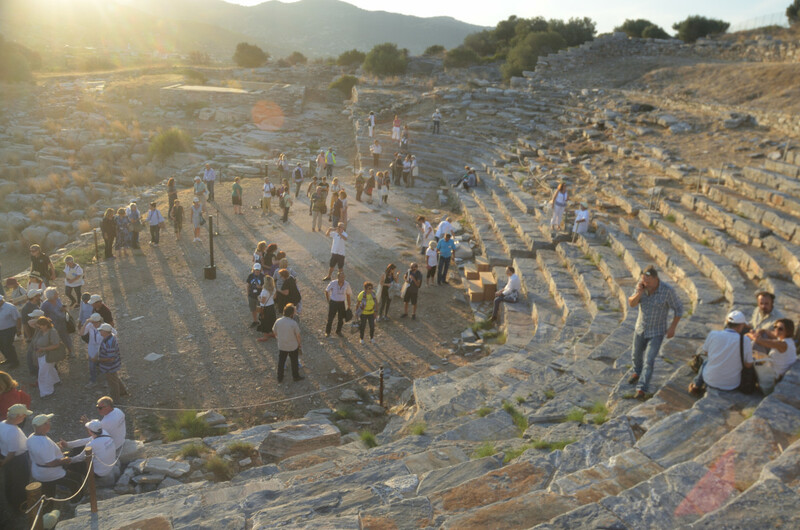 After building the upper cavea, the theater’s capacity increased from 2,000 to 3,200 viewers. 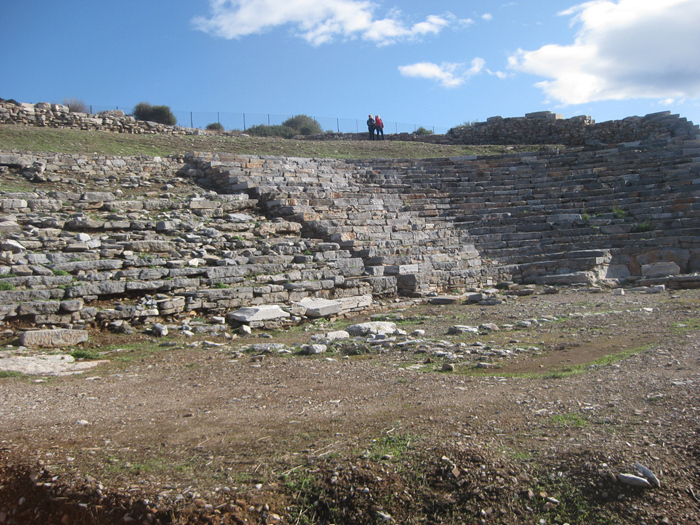 Recent excavations conducted by the Ephorate of Antiquities of Eastern Attica around the retaining wall of the orchestra revealed the older retaining wall throughout its length. It was also found that the site was originally used as a quarry of limestone, as did the entire region to the SW of the theater. This suggests that as a result of the mining an open space had been formed at different levels and this allowed people’s gatherings. This space had been gradually given shape due to successive interventions, which should be linked to the increased needs for citizens’s assemblies, following Kleisthenes state reform in 507 BC for the purpose of organization and operation of the democratic system. In “Calendar of sacrifices in Thoricus”, dated prior to 420 BC, there is a clear reference to the performance of the small or Rural Dionysia Festival in Thoricus in the month of Poseidon, as in the other municipalities of Attica. Inscriptions found south of the theater, dating to the end of the 5th century and the 4th century BC, provide information on teaching comedies and tragedies in Thoricus. It should be mentioned that the theater had multiple functions and not only the teaching of drama, which was after all lasting for just a few days each year. Miller, The Theater of Thorikus, Preliminary Report. Papers of the American School of Classical Studies at Athens 4, 1885-86, 1-21. L. Cushing, Theater of Thoricus, Supplementary Report, Papers of the American School of Classical Studies at Athens 4, 1885-86, 23-34. G. Kallipolitis, H.F. Mussche, Excavations in Thoricus, Archaeological Bulletin 19,1964, B 86.T. Hackens, Le theatre. THORIKOS 1963, Rapport Préliminaire sur la première campagne de fouilles. Bruxelles 1965, 39-46. Hackens, Le theatre. THORIKOS 1965, Rapport Préliminaire sur la troisième campagne de fouilles. Bruxelles 1967, 75-96. Oikonomakou, Theater of Thoricus, AD 56-59, Β1, 2001-2004, 356-357. Palyvou Cl., Notes on the Geometry of the ancient theatre of Thorikos. Archäologischer Anzeiger 2001, 45-58. Kapetanios A., Thorikos’ theatre; retaining walls – retaining chronologies? in R. Laffineur, R. Docter, THORIKOS 1963-2013: 50 Years of Belgian Excavations. Evaluation and Perspectives (under publication). Although preserved at a satisfactory level, the theater faces safety problems both for the edifice itself, and for visitors, mainly because of the building materials and the way it was structured. 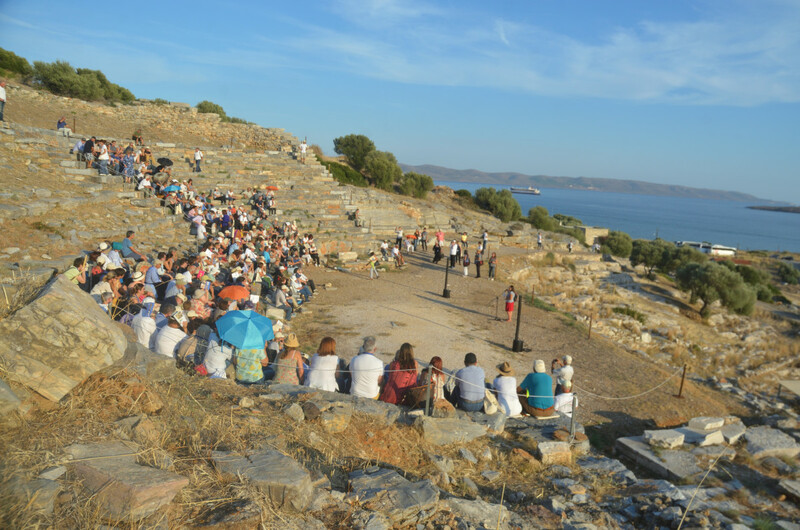 After World War II the monument suffered damages due to arbitrary excavation in the orchestra and in the cemetery to the South, conducted by the Mayor of Lavrion. The monument was illustrated by travelers in the 19th century. In 1885-1886 the American School of Classical Studies conducted the first excavations in the theater. In 1893 V. Stais excavated the important prehistoric monuments on top of Velatouri hill. Since 1963 the archaeological site of Thoricus has been excavated by the Belgian Archaeological School, initially in collaboration with the Greek Archaeological Service. The eastern tier of the theater was restored in 2001 by the Culture Ministry’s Directorate for the Restoration of Ancient Monuments. The program continued in the western and central tiers after 2011, while in 2012 the southern side of the orchestra was supported with a retaining wall. On the occasion of the restoration works, the Ephorate of Antiquities of Eastern Attica (former 2nd EPCA) performed research sections. 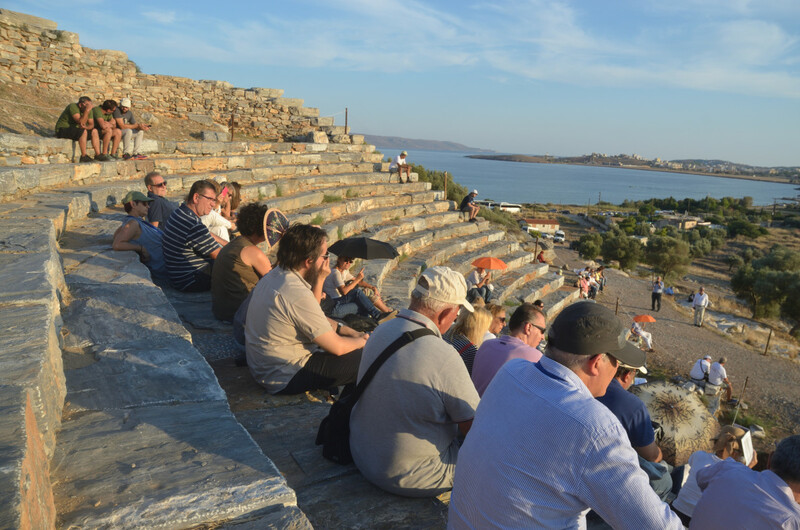 Performances given in the 1950’s as well as educational programs by the Ephorate of Antiquities of Eastern Attica.